Can machines think? 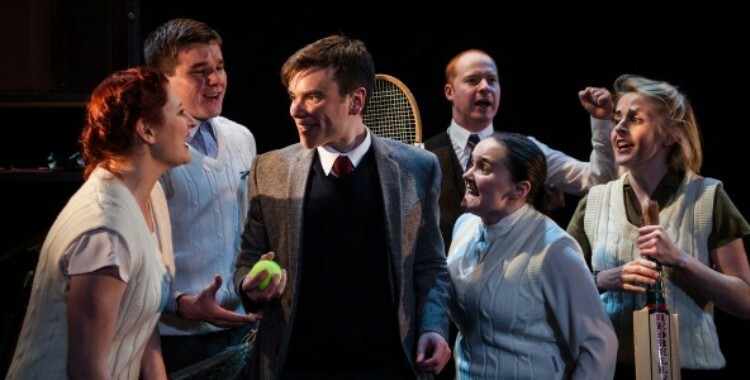 It’s a question that captivated mathematician and code-breaker Alan Turing, a life-long obsession with the mechanical that is signalled in the very title of this unlikely but intriguing new musical about his life. Here, the desire for a more machine-like existence – one without aging or change or any of the messy complications of being human – is a central and recurring if not fully excavated theme. The desire might be there, but its full implications resist exploration. Turing’s life and particularly his complex, pioneering work are not easily reducible to a concise two hour show, making writer and director David Byrne’s careful process of pruning and selection an impressive achievement in itself. He has taken as his focus this wistful fascination with machinery, a fascination that is contrasted with Turing’s few valued human relationships; his mother, portrayed in a moving turn from Judith Paris, is a constant background presence, while a youthful infatuation with close friend Christopher Morcom is shown to haunt the rest of Turing’s life and all his intellectual endeavours. He yearns for the uncomplicated existence of the machine, yet he wrestles with emotion that is far from coldly mechanical. It’s significant that when Turing looks to the future, predicting the rise of artificial intelligence, he speaks of machines that will be capable of love. Just like Turing, Byrne’s show can’t entirely shun the sentimental in favour of the mechanical, but for the most part this production avoids over-playing the tragic elements of its protagonist’s short life. Instead, attention is given to his extraordinary mind, its workings and its memories scrawled out on the stage of the New Diorama Theatre. Bare black walls, occasionally used to host projections, suggest the scholarly blackboard, while the near-constant presence of desks cements an atmosphere of sometimes feverish concentration. As Turing looks back over his life – a device of speaking across time that provides a useful if occasionally clumsy frame – a carefully selected range of props acquire the traces of memory, hooking the narrative into the next scene. As so often with the musical form, there’s the danger of a complex narrative being stripped down to a series of neat plot points, significant moments that offer the opportunity to break out into song. Dominic Brennan’s music is at its best when reflecting the mechanical workings of Turing’s mind, clicking along with a rapid pace reminiscent of the turning cogs of both machinery and mind as the Bletchley Park cryptanalysts build the bombe, the machine Turing designed to help break the Enigma code during World War II. Elsewhere, however, its use is not entirely clear, sometimes serving a plot function, sometimes offering emotional illumination – as with Sara Turing’s heart-breaking attempt to come to terms first with her son’s homosexuality and then with his suicide – sometimes simply providing a few laughs. Early on there’s the suggestion that the musical genre could intelligently unpick Turing’s painful difficulty connecting with the world, the song of those around him highlighting his own alienation, but this possibility quickly fades away. The production does, however, manage to convey a sense of a man out of place in his own time, a man who might well seek solace in machines when the human world disappointed and baffled him. In this central role, Richard Delaney is a quiet, awkward presence, still but for his habitual fidgeting, while the rest of the cast whirl chaotically around him. Turing might be at the centre, but he avoids the spotlight, remaining the fixed focal point of a narrative that becomes just as much about those around him. Fitting as the enigma of Turing’s personality might be, the fictionalised insight that the piece promises remains just out of reach. Turing’s story never fails to compel, but it leaves us frustratedly searching for more.